Yes, this can actually happen. Some things just go together: bread and butter, Laurel and Hardy, Forrest Gump's "peas and carrots." But golf and your steady who doesn't play? Well, that's just cats and dogs. Or Kardashians and talent. But ever since great pairings were first made, mankind has sought — and often struggled — to turn things that are good on their own into things that are great together. You love golf. You love your significant other. How do you introduce the two great loves of your life to one another? Hear this: It ain't no handshake introduction, but it doesn't take a miracle, either. 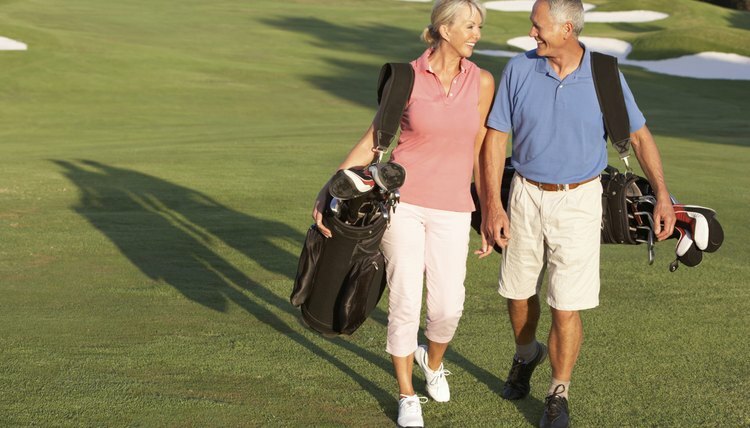 Diehard golfers can convince their less enthusiastic partners to love — or at least tolerate — the game, and that can have serious benefits for your relationship. As life coach Leah Jantzen said, “The term ‘golf widow’ exists for a reason. Golf is a very time-consuming, all-encompassing sport that is more of a lifestyle than a hobby. A relationship can certainly suffer if two people are not on the same page, especially with an activity that takes so much time.” And as your round last week can attest, suffering is not good. Drew Wilson is an award-winning blogger and writer with nearly 20 years of professional experience. He has written for radio, television and print, including celebrity gossip for "Us Weekly" and instructor resource guides for McGraw-Hill. Can Pregnant Women Play Golf?